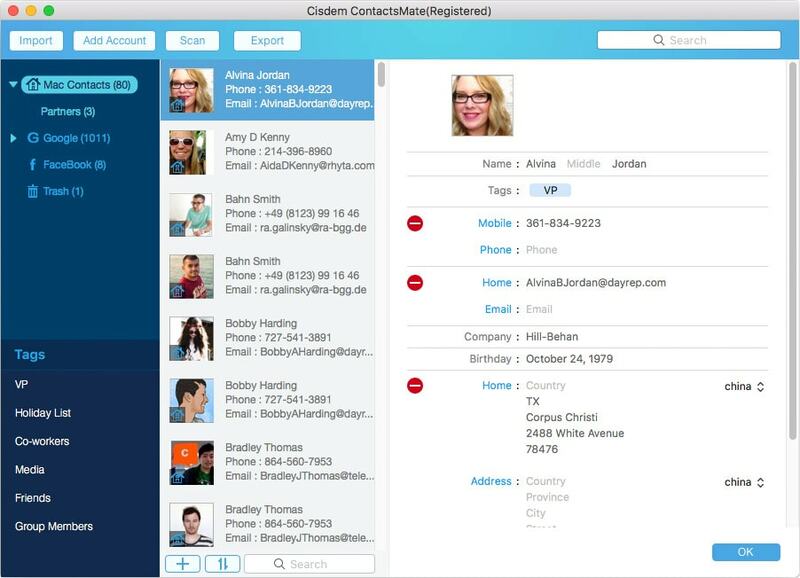 Cisdem ContactsMate 4.0.0 – Manage and backup contacts in one place. Cisdem ContactsMate (was ContactManager) is a great contacts manager. It allows you to backup everything in Contacts; edit the Contacts fields; find, analyze, report, and fix dozens of problems with OS X Contacts; and export your address book to CSV, vCard, TXT, DocX, HTML, Excel, Numbers, and Pages formats for easy Contacts backup or sync. The release of version 3 adds new functionalities: make a group for contacts, batch-fix similar problematic contacts, and manually set suffix or prefix. Make groups for contacts – You can make groups respectively for your family, friends, colleagues, clients or work contacts, etc. The options are endless, making it much more efficient and easier to find the targeted one(s). Batch fix all similar problematic contacts – After the problematic contacts are found out and sorted, you can perform bulk modifications on the similar questionable Contacts or neglect these problems as you will. Manually set suffix and prefix – You can add or delete available suffixes and prefixes themselves to improve the accuracy of problems scanning. Besides this, suffixes and prefixes can be added in their own languages, which is very handy for users from non-English speaking countries. Newly added menu bar access for quickly add, find and make phone calls or send messages, etc. Add the function of sharing contact list via Mail, Messages, Facebook, Twitter, etc. Next story Mia for Gmail 2.2.7 – Gmail without a browser (was Notifier Pro for Gmail). Previous story AnyMP4 MTS Converter 6.2.37 – Convert MTS/M2TS/TS to popular video format . Cisdem ContactsMate 4.2.0 – Manage and backup contacts in one place. Contacts Journal CRM 1.2.2 – Track your customer and client relationships.